← It’s a Bird, It’s a Plane…No, It’s a Giant Hello Kitty?! 1. 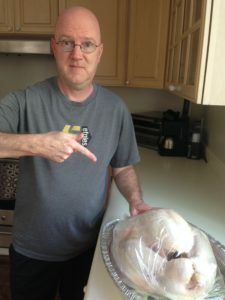 Here’s the turkey I cooked for Thanksgiving – ready to go into the oven! Turkey is ready to cook! 2. Now you see the turkey 2.5 hours later – ready to go into my mouth! 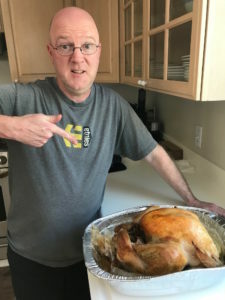 Turkey is ready to eat! 3. After the turkey, there is of course pumpkin pie, traditional at Thanksgiving dinner. 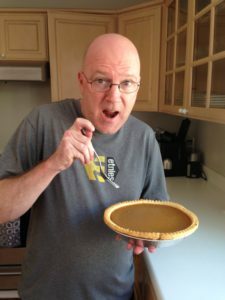 Time for pumpkin pie, baby! You could use any of these three words to describe what I did yesterday – I stuffed myself with turkey, gorged on mashed potatoes, and generally overindulged the whole day! To learn more about Thanksgiving, see here and here. This entry was posted in Language & Terms, Life in the United States. Bookmark the permalink.